As many of you know, I love volunteering my time for charity. This is the second year that I’ve been the co-chair for the United Way campaign where I work. Co-chairing aside…I always run our bake sale. I love baking plus I love giving to charity so it’s a match made in heaven. Unfortunately, this year I failed to realize that I would be living in a rental condo that is a bit *ahem* lacking in the baking supplies department. 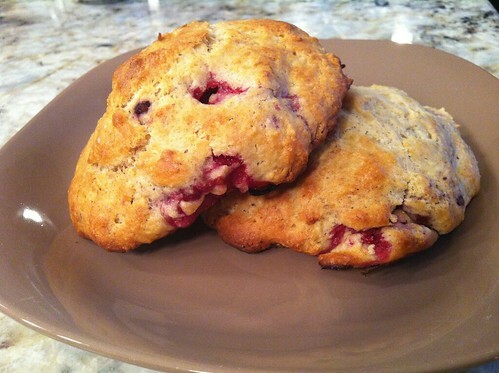 I decided to try my hand at making scones using my friend Julie’s recipe. So off I went to the grocery store to buy those things I take for granted since they’re always in my pantry. Like flour, sugar, salt, baking soda & a lemon zester. What I didn’t realize was that I didn’t check to see if we had measuring cups. I had to use a Pampered Chef prep bowl as a measuring cup b/c I had no liquid cup. I had to figure out what sizes the measuring cups in the condo were b/c they weren’t labeled. I kept setting the timer for 10 hours instead of 10 minutes (I did this at least 3 times). I didn’t realize that I only had one cookie sheet so I had to improvise and use a glass baking dish. Now you see why I called the little scones that could! Regardless of my goofs, they turned out pretty good. 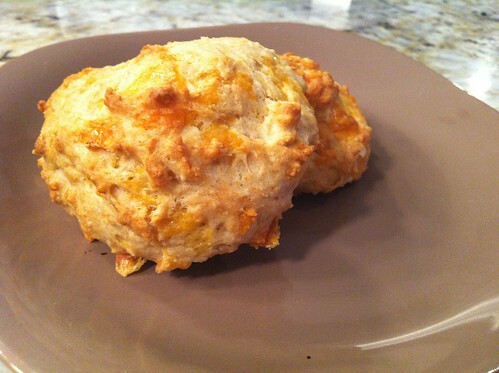 I would tweak a few things if I make them again but overall….yum. Scramble egg in a measuring cup & then add milk to make 1 cup. Pour in flour mixture and mix until just combined. Add berries/lemon or cheese and fold in. Drop by large spoonfuls onto a parchment lined baking sheet. Large scones take about 20 - 25 minutes. Small scones take less time. Cook until browned. What are your best near (or total) baking disasters? Yum! I love forgiving recipes.